We’d love your help. Let us know what’s wrong with this preview of One Hundred Reasons by Kelly Collins. To ask other readers questions about One Hundred Reasons, please sign up. …the air was filled with a scent that seemed to be synonymous with the elderly. Sage tried to figure the smell out, but the closest thing she could ever come up with was Bengay for arthritis mixed with contraband candy. She confiscated the candy and reminded David Lark that a man with diabetes shouldn’t feed his disease. “Come on! I gave up women. I gave up alcohol. I gave up swearing. I’m dying.” He watched her tuck the candy bar into her pocket. When Sage opened her mouth, the man popped a Life Saver from its wrapper straight into it. The cherry flavor coated her tongue. She wasn’t sure if it was supposed to ease the pain or shut her up. It did both. I work for peanut butter cups and Skittles… I’m cheap, but I’m not easy. She’d arrived and disrupted his status quo, making him realize it had been status woe. I adored this sweet small-town romance as I have every other Kelly Collins book I have ever picked up. Her characters tend to be flawed, wounded, endearing, and doing their best in a difficult situation and the main characters of this entertaining tale, Cannon and Sage, fit this description as well. The storylines were fresh, relevant, emotive, and thoughtfully observant with hits of humor and steam. I am excited about this new series of stand-alone stories and am already looking forward to the next installment. 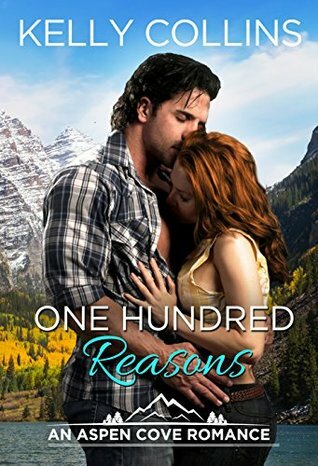 One Hundred Reasons (An Aspen Cove Romance Book 1) by Kelly Collins I won from Kindle Scout. It is not my type of reading genre but I voted for it because I thought it would win, it did, and I got the book. Although I don't normally read romance books unless it has a paranormal feature this was pretty good. A sweet and tender romance with a feel good ending. I guess it is good to get out of my box once in a while! This was a sweet romance. I like the characters, even their flaws. They have genuine struggles and they grow and heal. I enjoyed the story. Kelly Collins has written the start of another fantastic series. One Hundred Reasons had my emotions all over the place as I read it. It is a beautiful, heart-warming story set in a small mountain town with many possibilities. Sage and Cannon are well written, and I completely fell in love with Aspen Cove. I'm excited to read the next book in the series. This is the first book in what appears to be an awesome series. Sage and Cannon are just the first characters that are going to give us a few hours of relaxing (well when they aren't being stupid) peace. I found that I enjoyed the characters and the sleepy little town of Aspen Cove. I'm eager to see how this plays out. You get a feeling of home as you begin to get to know these people. Dual point of view. No cliffhanger. Just another all too predictable romance featuring well used tropes. Nothing new here. This was a very cheesy and occasionally cringy romance read. My book kryptonite is small town settings, with the crazy small towners who stick their nose into other people's business. And I got a lot of that in this book, which I adored. This had all the potential for a real good slow burn, as the main characters don't have the best first encounter, but the 'grouchy' Cannon Bishop quickly lost his somber nature. I wish there had been more build up in terms of the relationship, I didn't really get a good feel for them before it ended. I also did not enjoy the main character Sage, RN who was described as a 'bleeding heart', always there for others. This was a case of spoken not shown, because Sage often came across as judgmental and immature, her chapters made it often hard for me to finish it. The setting had so much potential, but the main character and lack of development let it down. I read this book back at the beginning of October and I've read so many books since then that I don't really remember this one. But I do know I enjoyed it enough to get more books by this author. I would probably remember it better if I gave it more time but I'm trying to get all my 2018 reads in by the end of today. One Hundred Reasons, by Kelly Collins, is a contemporary romance with strong characters in an ideallic setting. I was hooked in to the story of Sage, a nurse working the night shift in a geriatric hospital ward - from the first chapter. This was surprising to me because modern, real-world stories don’t often draw me in; my preferred genres are usually fantastical or historical in nature. But perhaps what got me to keep turning the pages was the strength of this story’s characters; Sage is a fier One Hundred Reasons, by Kelly Collins, is a contemporary romance with strong characters in an ideallic setting. I was hooked in to the story of Sage, a nurse working the night shift in a geriatric hospital ward - from the first chapter. This was surprising to me because modern, real-world stories don’t often draw me in; my preferred genres are usually fantastical or historical in nature. But perhaps what got me to keep turning the pages was the strength of this story’s characters; Sage is a fiercely independent young woman who obviously cares for others both on and off the job, but struggles to understand and express her own emotions. When her favorite patient, Bea, dies - Sage is left an unexpected gift from her - the ownership to a Bed and Breakfast in the small mountain town of Aspen Cove. Sage had heard stories of Aspen Cove from Bea in the hospital, but never knew it was a place that actually existed. The story that unfolds could easily be imagined as a Hallmark Movie; Sage visits Aspen Cove and meets a single young man named Cannon who is described as both good looking and emotionally unavailable. Of course, complicated feelings ensue - and both young protagonists will need to deal with their mixed emotions, including their developing love for each other. Sage also needs to decide what to do with the business that she has inherited, and whether or not she will stay in Aspen Cove. Will she choose her practical career in the city? Or will she follow her heart? In the end, this is a romance novel that, while predictable as any Hallmark Movie, is still an enjoyable read. Collins made me care about her characters enough to finish the book to the last page - even though I already knew it would have the “happy ending.” I also enjoyed the ideallic, mountain setting of Aspen Cove; it’s the kind of place that everyone would like to visit, and some people will want to stay. Undoubtedly, many fans of contemporary romance will be happy to pick up this book, and look forward to their next trip to Aspen Cove. One Hundred Reasons was a beautiful love story that took place in a small town of Aspen Cove. The storyline was so good, fairytale like, and kept you interested. Aspen Cove was a little town with a big heart. The townspeople were an unique bunch but cared for all. Cannon and Sage were amazing together, loved them! I can’t wait for One Hundred Heartbeats! I just loved this heartwarming sweet romance story by Kelly Collins. Both Sage and Cannon were very believable and likeable characters. I liked Sage's open-heartedness and the way she always gave her all and gave chances to strangers. She was a lovely girl you could always count on, always looking how she could help others. Cannon was her polar opposite with his closed off personality at first. Even though he started on the wrong foot with Sage he soon had to realise how good and forgiving she w I just loved this heartwarming sweet romance story by Kelly Collins. Both Sage and Cannon were very believable and likeable characters. I liked Sage's open-heartedness and the way she always gave her all and gave chances to strangers. She was a lovely girl you could always count on, always looking how she could help others. Cannon was her polar opposite with his closed off personality at first. Even though he started on the wrong foot with Sage he soon had to realise how good and forgiving she was to everyone including himself. A charming story about a young woman with a heart as big as an ocean and a need to be needed. An elderly patient leaves her a B&B property in Aspen Cove and changes her life forever. First book I’ve read by this author and I will look to read more by her. I received a complimentary copy of this book from the Kindle Scout programme. I was not compensated for my review, and I was not required to write a positive review. The opinion expressed here is my own. Oh how I wish that I had met Bea ! She imbues the whole book with her presence, like a phantom puppeteer. Sage nurses her in the hospital and finds that meeting Bea changes her life. She moves to Bea's home town after she dies and leaves her a house. She meets her new neighbors and finds new friends as well as love. A moving story. The story drew me in right away. It wasn't over inundated with details. I only skipped a small part. The people were.real and the town wonderful. I got lost there. It is a place I would love to live. What a sweet romantic book. I loved the whole storyline. Sage was a nurse that took death hard Cannon was just trying to deal with life and family. Neither looking for love. Sweet romance. I really enjoyed this even though I usually like more steamy scenes in a book. The story was really good plus well defined characters. I'm definitely going to read the others in this series when they come out. An honest to goodness great romance! Sage is a sweetheart nurse from Denver, moving to small town Aspen Cove. There she meets hunky Cannon and sparks fly. This book gives you all the good feels and great ending. Pretty good book. I enjoyed it. Kinda predictable, but still a nice, sweet, romance. “Change would come to Aspen Cove.” This lovely book set in a small town in Colorado is about love, life, and possibilities. This delightful read gives us a look at the slow, small town life where residents are charmingly in each others business, in the best way possible. I spent a lovely afternoon reading this adorable book, falling in love with the citizens and wishing I could go to my happy place of Colorado. “There were three things Sage Nichols knew with absolute certainty: Death couldn't be “Change would come to Aspen Cove.” This lovely book set in a small town in Colorado is about love, life, and possibilities. This delightful read gives us a look at the slow, small town life where residents are charmingly in each others business, in the best way possible. I spent a lovely afternoon reading this adorable book, falling in love with the citizens and wishing I could go to my happy place of Colorado. Characters Sage doles out her “Sage Advice” to those she meets. Part common sense, part positive thinking, with an overwhelming need to help those around her, Sage struggles with the change from Denver to Aspen Cove. But she runs into local Cannon Bishop who has more than his share of woes and troubles to deal with, let alone an outsider. Sage's helpful drive both frustrates and endears her to Cannon, while she wriggles her way into his life. I found both characters quite believable, with undeniably real and detailed back story that provides proper motivation for their actions. The heat and chemistry in this book starts as opposites attracting. I liked how Sage and Cannon fought and interacted and came to work together before seeing if they would work together. Despite some hiccups, the bumps they encounter quickly turn from friendly to friendlier. :) Their relationship has ups, downs, problems, trust, and lots of spice. Ms. Collins gave us a book that was a fun, and easy to follow read. Her wording and writing style are entertaining and thoughtful. You are easily and quickly drawn into the community of Aspen Cove. With seemingly no effort, you are drawn into the lives of not only Sage and Cannon, but the other charming residents of Aspen Cove. I'm so glad I was able to read this book. Aspen Cove sounds like my kind of place (Colorado makes my soul happy). The world needs more people like the residents of Aspen Cove. Helpful, in your business, ready to stand up for those they care for, and able to live in one of the world's best location! I'm excited to read the rest of the series! Sage was a nurse it was a job she loved. She took a job in the geriatric ward to be closer to her dying grandmother, just to be able to spend more time with her in her final hours. When her grandmother past, Sage realised that helping others brought her joy even though she wanted them all to live forever. It was only when Bea, Sage's favourite patient had died while she was away that she found it hard to let the patients go. Little did she know that the bright pink stationary that she had been br Sage was a nurse it was a job she loved. She took a job in the geriatric ward to be closer to her dying grandmother, just to be able to spend more time with her in her final hours. When her grandmother past, Sage realised that helping others brought her joy even though she wanted them all to live forever. It was only when Bea, Sage's favourite patient had died while she was away that she found it hard to let the patients go. Little did she know that the bright pink stationary that she had been bringing in for Bea would make such a difference to not only her life but everyone that received one of the letters. Sage found herself traveling to Aspen Cove, this was where Bea had owned a B&B but had left the deeds to her, she was going to go there just to see it before she sold it on. She was a nurse in Denver what did she know about running a B&B in a small town she had never even heard of. When she arrived things didn't go to plan, she met Katie Middleton, a young lady from Texas, they had an instant liking for each other. Then Cannon Bishop stormed into her path and her visit to Aspen Cove turned worse. She didn't want to stay in a small town with small minded rude people, she would be out of there by morning. It was only after meeting Cannon's dad Ben that Sage had to meet up with Doc Parker. He told her about the way the resident's of Aspens Cove lived, just helping each other to survive. Would Sage be able to stay in such a small town? Was there a good enough reason for her to stay? Katie needed her help at first. Could she leave her new friends Katie, Doc and the Sherrif? The longer she stayed the more she felt at home. Sage came to realise that her sister was OK without her living in the basement and she was OK looking after what Bea had given her. She knew there must be a reason that she had been given the B&B. Was it like they told her it was because she wasn't a quitter or did Bea have other reasons for sending her to Aspen Cove? Sage is a geriatric nurse in a large hospital. She moved to this department in order to spend as much time as possible with her mom when she was dying and stayed on afterwards. She loved her job and her patients but one held a special place in her heart. Bea had a heart condition but Sage came to love her. She got writing paper for her and talked to her a lot about Aspen Cove where Bea came from. One day Sage came to work as usual and made all her rounds, leaving Bea until last to have a bit more time with her. She had a new lot of pink writing paper for Bea too. When she got to Bea's room she found it empty and knew that she had passed on. She took it hard and sat in the room crying for half an hour and subsequently found herself in front of her supervisor. The hospital had decided that she was too emotional for the job and she was put on suspension until such time as an opening was available in another section of the hospital. As her world came crashing down on her she received a letter from Bea. In it was enclosed the deed to a bed and breakfast in Bea's home town of Aspen Cove. Taking a chance she decided to go and look the place over. It was not a case of love at first sight. In fact she decided to get out of there as soon as possible. It wasn't to be that easy though. First there was Katie who Bea had left the local bakery to, then there was the crusty old doctor who welcomed a qualified nurse; there was also Ben, the town drunk who she wanted to help and, last but not least, there was Cannon his son and her neighbour. These people, and others, showed her a new way of life where everyone looked out for each other. She just had to decide if this was the life for her. This is a heartening contemporary romance that most will enjoy. This is a terrific start to a new series. It is well-written and grabbed my attention from the beginning and never let go. The characters have depth and I truly cared about them. I would love to live in Aspen Cove. Sage takes a giant leap of faith moving to Aspen Cove and it turns out to be the best thing she has ever done. Her soul is rejuvenated as she is able to really help people who need her--even if they didn't know they needed her. Cannon is the perfect name for the hero! He is like a cann This is a terrific start to a new series. It is well-written and grabbed my attention from the beginning and never let go. The characters have depth and I truly cared about them. I would love to live in Aspen Cove. Sage takes a giant leap of faith moving to Aspen Cove and it turns out to be the best thing she has ever done. Her soul is rejuvenated as she is able to really help people who need her--even if they didn't know they needed her. Cannon is the perfect name for the hero! He is like a cannon-ready to explode and take out everything in his path. He is also a good man with a big heart who has had all his dreams shattered. My heart ached for him. He is one who didn't know he needed Sage's help until she refused to stay out of his life. They had chemistry! WOW!! Sparks flew whenever they were together. Sage was just as strong and stubborn as Cannon making them a perfect fit. Aspen Cove is chock full of interesting, quirky, realistic characters that I can't wait to get to know better. I am really looking forward to meeting more residents as the series unfolds. There are at least one-hundred reasons why I strongly urge you to read One Hundred Reasons. I recommend checking out all the books written by the very talented Kelly Collins.